When an inspector takes the cover off the electrical service panel, they never know what they are going to find. Of course if they cannot take the cover off at all, like the one behind the mirror, in the picture to the right, there are a lot of things they won’t be able to talk about--either wrong or right. As a home inspector it is always very distressing when I cannot get inside the various electrical panels at a properly. Typically I must recommend that they have me back for proper evaluation or to have the panel properly evaluated by an electrician. If an inspector was to open the panel in the next picture, what would they see? Well since there is no single-breaker disconnect, the inspector should be asking themselves, is this split-bus type panel? Of course it is a split-bus panel. Such a panel does not have a single main disconnect breaker but has multiple breakers that constitute the service disconnect. In this type of panel there will be a maximum of 6 breakers (throws) to turn off all the power to the circuits in the home. This particular panel has 7 throws and therefore is in technical violation of the rule of having no more than 6 throws. Typically those 6 breakers will all be 240 volt breakers, but as additional circuits are needed, some of the 240 breakers can be removed (if not needed or not present to begin with) and replaced with single pole breakers. 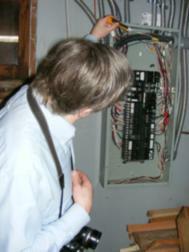 Another thing an inspector will note is the number of muti-wire circuits that are in the panel. They will want to know if they are properly wired, because miswiring of multi-wire circuits is very common and can be very dangerous. They are commonly miswired when single pole breakers are replaced with twin breakers. The twin breakers allow for installation of two breakers (circuits) in one space in the panel. It is super important for the red and black wires to terminate on different bus bars in the panel to not result in overheating of the shared neutral wire of the circuits. With mini-breakers it is easy for unqualified parties to wire the breakers so that the wires end up on the same bus bar. Without getting overly technical, just trust me this is bad electrical juju. So far everything the inspector has seen is evidence of a service panel that is no longer adequate to the needs of the home--because the addition of circuits has left the panel possibly compromised. Unfortunately there is actually a more interesting and complicated issue to consider. For me, the first thing that jumped out, even before the lack of a single breaker disconnect and the multi-wire circuits, is that all the wires to the 15amp and 20 amp breakers seem bigger than normal. All the 15amp breakers have #12 gauge wires attached to them and all the 20 amp breakers have #10 gauge wires attached to them. My immediate reaction was that this house is wired with copper-clad aluminum wiring. This always represents a dilemma for the home inspector because we are required by our Standards of Practice in Washington State to report on “solid conductor aluminum” wiring found in homes and call for further evaluation by a licensed electrical contractor—including that it may be a safety hazard. One electrician was called in by the seller to “evaluate” the wiring and he claimed that the wiring was not copper-clad at all, but was all solid copper type wire. My reaction was to have the wiring evaluated by a different electrician as this one certainly did not know what they were talking about. Even some of the wire covering in the panel should have been a pretty good hint. But because the home inspector is required to raise a red flag and wave it at the wiring, all parties in the transaction become affected. Because the “ugly cousin” has made such a nuisance of itself in homes—and truly deserves the reputation it has—many people, including jurisdictional inspectors, cannot embrace the idea that, THE TWO TYPES OF WIRE ARE NOT THE SAME THING. In fact, brand new, 2014, receptacles that are Tamper Resistant, come rated for both copper and copper-clad wires. This is a testament to the fact that receptacle manufacturers do not see a problem with copper-clad wiring. The problem for homeowners is compounded when jurisdictional inspectors, due to lack of information, can decide to not approve any modifications to the electrical system, including changing the receptacles to new Tamper Resistant type receptacles, if the wiring is copper-clad. There are “work-arounds,” but none that do not involve more expense and in some cases additional unnecessary connections to get the older wiring to the new receptacle. In other words, the jurisdictional inspectors can create problems where there are none, resulting in additional costs to the homeowner. PS. In the case that this post was about, the local jurisdiction, based on the information the electrician was able to provide (based on my information), reversed itself and will allow the use of the approved receptacles saving my buyer thousands of dollars.